Here's one interpretation of what the vibe of our planet is. 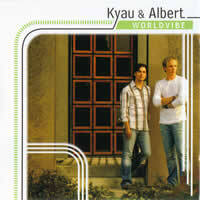 To fans of the trance scene, the production team of Ralph Kyau & Steven Moebius Albert needs no introduction. Releasing their sophomore album in the ninth year as a duo, Kyau & Albert have settled down into their cozy little place among their fellow trance comrades. With two years to continue to perfect their craft after their smooth debut album was released in August 2004, now is the time to show off their new skills. Did they succeed in creating another entertaining work, or is this just fluff? The first disc starts off with Walk Down, and to be honest, ever since I first heard this track, I've always considered it to be one of those songs that could have been great, but only if someone else had performed it. This is the first song of many on this album to feature Steven Albert's arguable vocal talents. His vocals are definitely an acquired taste, and you'll either love them or hate them. There's no average tolerability here. "Walk Down" is a rather flat entryway into the album, featuring a solid funky beat, a full bassline and faux strings to backup Albert's crooning. It's not a catchy tune, however, even though it was pawned off as a single alongside an instrumental track on this album, "Kiksu", which I will talk about soon enough. Thankfully, "Walk Down" does not accurately reflect the rest of the album, which is a good thing. Always A Fool is a good representation of the sound of modern UK trance (even though Kyau & Albert are from Germany). A very simplistic composition, it still tugs at the ol' heartstrings with a smooth bassline and an obviously fake plucky guitar in the background. The vocals are performed not by Albert, but by the pretty much unknown Viola Manigk. The vocals, although pretty standard-sounding in comparison to the general trance scene, are actually quite gentle and effective; there's no loud Aguilera-esque maximation here, and it suits the relatively calm tone of the song. Overall, a good track for the album to fall back on after the hit it took from "Walk Down". Next up is Kiksu, perhaps one of the primary reasons for anyone to buy this album. I can't explain it, but there's some sort of mystical power that overtakes this instrumental track and creates a truly wonderful experience. Using euphoric chiming synths and a repeating hook as the melody, you have something so simple yet so invigorating! Plus the oral stylings of Steven Albert are nowhere to be found here, so that's an added bonus! This is definitely one of the high points (if not THE apex) of the entire album, so be sure to listen to this one, because you'll listen to it once, then twice, then even more times! Magnificent simplicity, that's the main point I'm trying to convey. Run has the unfortunate task of following "Kiksu", and it doesn't truly cut it. With a nifty little trance breakbeat in hand, Kyau & Albert grab another female vocalist in Julia Lutat, whom they had worked with on a track from their previous album. Unfortunately, this is a drab affair; nothing stands out, not even the chorus. This track, although certainly not skimpy on the bass, is pretty much just filler as we make our way to the next track, Are You Fine? This serves as another highlight on the album, boasting reverbed electric guitar (or at least a synthesized sound of one), raging synths used more effectively than in the similar but ultimately pussified "Walk Down", and a tough thumping beat that will keep your ears in check. Surprisingly enough, even Albert's voice sounds like it belongs here. The lyrics are vanilla as well: "Following your trace with a knife, are you fine? Are you fine? I hate you, I love you, I need you, I cry; are you fine? Are you fine?" Yeah, that's about it. The melody itself is not complex, but it compliments the fair words of Steven Albert suitably. "Are You Fine?" is another highpoint on the road that is "Worldvibe". We are treated to tribal rhythms as Metrosun makes its way through. While the majority of the song is, in fact, comprised of these rhythms, in the middle is a catchy bit of trance that sounds rather common but is still nice to the ears with a filtered tubular synth and a deep house-like bassline. Still, the jungle beats do not allow for the trance aspect to blossom into fruition, and so we are left clamoring for more. The Jitters follows this, starting out with a dark and foreboding pad which is eventually accompanied by a light snare; ambience is the key here, so it seems. The song does get somewhat louder, but still retains the ambient sensibilities that it started with. The sound of some guy speaking and sighing in the background is a bit freakish though. Yet all is not perfect, as Steven Albert returns in 7Skies to give us some more of his singing charm. Using a very unusually flanged synth, this tune is a rather subdued track that fails to reach any particular climax or melodic peak. Albert's vocals are pretty much the same: average-at-best. It seems that his buddy Kyau was fiddling with random knobs at some point, because Albert's voice seems to be pitched at certain points to octaves that he could never reach in reality. It's unusual, but it does shake things up a little bit. Overall, there's nothing stunning about this track, but it isn't the worst display either. Our Own Devices is... well, pretty much just the two guys playing with all the wacky gadgets in their studio. There's no melody to this one; it's an amalgamation of random samplings that they may have had lying around on floppy disks. It's a mashup of goofy proportions, but it's less than two and a half minutes long, so you might as well listen to it at least once. It feels more like an interlude than anything substantial. And it does transfer us to the unusual but still fun Riding On A Star, which uses more flanging to create an2:30 AM 11/21/2006 upbeat funky song that incorporates Albert's vocals, but drowns them out fairly well with the tubish synth and groovy bass. This, too, is a higher point on the album. Albert will not remain quiet for long, as he's back once again. Hide & Seek feels like a mixture of elements from "Walk Down" and "Always A Fool", jumbled together to create a slower-paced hymn for those who want to take a breather after they overboogied during "Riding On A Star". If you are a lover of Albert's descanting, you won't go wrong with this pop-injected song that is the true showcase of his vocal abilities. This is probably as close to direct pop as you'll get on this album, so if that's your cup of tea, have a listen. If you want a little more "Kiksu" in your step, this won't be for you. Continuing with the downtempo vibe is Teddybears, which is perhaps the most ambient piece of the album. The melody is very soft but eventually it comes into plain sight... or plain audio, I guess. Why it's called "Teddybears", I don't know. Perhaps because it's such a soft track? Heh... yeah, that's why. This, like "Our Own Devices", is short as well, and leads into the finale, Hooked On Infinity, another ambient voiceless track that aims to relax while tossing in random space noises and laser pings. As the track progresses, the many pads and synths come together to deliver a watered-down "Kiksu" for us, but without the thumping beat or the deep bassline. A very classy way to end their new album. Just when you thought the fun was over, however, we are treated to a bonus disc, containing eight more tracks -- mostly remixes or full versions of songs featured on the first disc. Let's have a look at those, shall we? First off is the Kyau & Albert Vocal Mix of Sirens Of The Sea by OceanLab. OceanLab has been known for creating beautiful trance tunes that lift the spirit, especially with the help of famed trance vocalist Justine Suissa. Though it was not released officially as a single (either on physical disc or on vinyl), it has still garnered acclaim from the trance scene. Kyau & Albert deliver their standard touch to this song, making it sound like it belongs on their own album. It's a good remix to listen to, and feels very much like an extension of the first disc. Next on parade is the Kyau & Albert Remix of Gabriel & Dresden's Tracking Treasure Down. I have always had mixed feelings about the original version; it seemed like a hollow, cheesy song that was put together in about an hour. So it comes to pass (in my mind at least) that any remix of this song will automatically make it much better. Kyau & Albert's remix does just that, but even their special magic can't save this dismal track. I think it's official that when you start with bad material, you'll end up with bad material. Kyau & Albert tried their best, but this meat was already rotten before they got there. The next three tracks are basically the original mixes of the three singles -- "Walk Down", "Kiksu", and "Are You Fine?". If you really need unmixed versions of these songs, then... here they are. Following these is their remix of Find by Ridgewalkers featuring El. I haven't heard the original, so I can't make much commentary in that regard. This remix features as a fair amount of repeated vocal chopping (literally), but when all that's done and the soft pads take over, the female vocals are different from what I'm used to. They're a bit whispy, but still listenable. Again, this sounds like a Kyau & Albert song, and it's not bad. Nothing eye-poppingly outstanding, but it's a worthy addition to a bonus disc such as this one. Markus Schulz takes the reins of "Are You Fine?" with his own remix. To be honest, I don't consider this to be anything special. There's some guitar stuff ripped directly from the original, and then he fills in the middle of the track with a goofy weak bass synth that doesn't reflect the original in any way (even putting the vocals over top of the bass would have helped the situation). I deem this remix uninspired and unnecessary, and I won't say another thing about it. And finally, here's something a little different: the Boom Jinx remix of "Kiksu"! I was initially a little weary; I didn't want anyone messing around with the already perfect "Kiksu"! Boom Jinx totally twists things up with a more tech-trance sound while still keeping the original melody intact (although it's playfully hidden at times). It's a bit funkier and danceable than the original, and doesn't use those Kyau & Albert signature chime synths like the real duo does, but it still gets my stamp of approval! This bonus disc also features the video for "Walk Down". I watched that video once -- and then I probably won't do it again. It's pretty much just a mixture of the two guys wandering or driving around with no apparent aim and computer graphics that wouldn't be out of place if this was the early 80s. Don't you guys know that this is 2006? Your music video should not look like it was made on a budget of $53.72. Please try again. So what else can I say that hasn't already been said about this album? If you actually read the words I wrote in this review, you'll note that this album is a hit-and-miss situation. Some tracks are stellar, while others are filler to pad out the album. As a whole, it does show the spectrum that Kyau & Albert is capable of. On the other hand, it is actually a little less interesting than their previous outing, "Here We Are Now", from 2004, which seemed to have a bit more mainstream appeal. The choice is ultimately yours, but I recommend previewing the album before making a solid purchase. The bonus disc does add some great value to the collection though, so be sure to include that in your considerations.